vHost provides a very high performance local LinuxIO for KVM guests. LIO vHost architecture and data processing. LIO self-hosted with Cent OS guest. The LinuxIO vHost fabric module implements I/O processing based on the Linux virtio mechanism. It provides virtually bare-metal local storage performance for KVM guests. Currently, only Linux guest VMs are supported, with Windows support under development with a virtual LSI MegaRAID SAS driver. LIO vHost allows effectively running very high-performance applications, such as database engines, in KVM guests on local storage. The Linux performance numbers were measured on a dual Intel Xeon-E5-2687W 3.10 Ghz CPU Romley-EP system with 32x threads and 32 GB DDR3-1600 SDRAM. The results for one single KVM VM and a varying number of LUNs are as follows. Datera will enable Windows guests to achieve the same level of performance with a virtual LSI MegaRAID SAS driver. 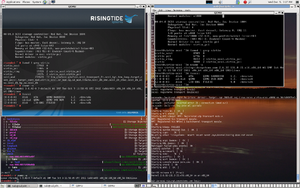 The KVM guest wakes up and dequeues the I/O descriptor(s) off the virtio ring. 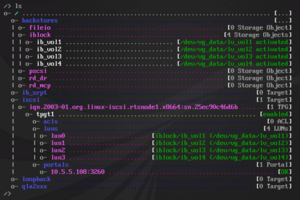 targetcli from Datera, Inc. is used to configure vHost targets. targetcli aggregates LIO service modules via a core library, and exports them through an API, to provide a unified single-node SAN configuration shell, independently of the underlying fabric(s). The LIO Admin Manual provides comprehensive background and many examples on using targetcli and on programming the RTS library. In particular, the iSCSI spec file /var/target/fabric/vhost.spec is included via RTSlib. ↑ Nicholas A. Bellinger (2012-08-07). "SCSI small block random I/O performance on 3.6-rc0 using SCSI loopback ports". http://permalink.gmane.org. ↑ a b c d IOPS results are currently impacted by limitations in the vHost interrupt processing implementation. The underlying bottleneck is being addressed, and future RTS vHost releases will scale up IOPs much better with more LUNs and vCPUs per VMs. Hajnoczi, et al (2011). 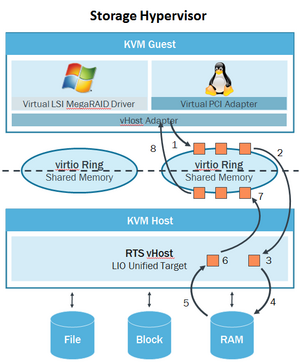 Virtio SCSI an alternative virtualized storage stack for KVM. KVM Forum, Vancouver, Canada: YouTube. This page was last modified on 10 March 2017, at 22:03.